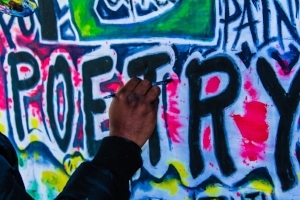 Check out this very informative Q&A between Terrapin Books publisher Diane Lockward and author Karen Paul Holmes on resubmitting a previously rejected poetry-book manuscript. Since I have several manuscripts written but no book deal yet, I struggle with the question of whether I should bother sending a book that’s been retooled back to the same publisher. This Q&A hit home and gave me some great insight on this subject. Breaking Free from Line Break Habits. If you really look at it, the only distinction between free verse and a prose poem are line breaks. Yet I often read poems where the line breaks don’t do anything that the syntax of the sentence doesn’t already do on its own. Maybe this is just my pet peeve, but I own it and feel the need to talk about it. and stop briefly at periods. before moving on to the next. So if the line breaks just echo the pauses and stops already inherent in the text, what’s really the point of writing a poem instead of prose? When it comes time to revise, I challenge myself to think about the line breaks. Sure, some breaks just come together with the ends of phrases and sentences and effectively reinforce those stopping points. But I also consider how line breaks can offer a counterpoint to my syntax, creating tension between the rhythm of my sentences and the rhythm of my lines. I’ve been working on this personally, and I think it might be a path to better poetry.